Taiwan is a mountainous island. Although relatively small with just 36,000 square kilometers of total land area (400 km length, 150 kms width), 70% of it is covered by mountains, 286 of which reach over 3,000 meters (9,800 ft.) above sea level. Taiwan’s climate is heavily influenced by the surrounding ocean, and the annual East Asian monsoon brings with it high humidity and significant amounts of rainfall. These characteristics all combine to make Taiwan an island of extremes, with deep valleys of lush, subtropical forest on the one hand, and cold, oxygen-deprived, precipitous high-elevation peaks on the other. The Formosan mountain dog (abbreviated here as FMD) has inhabited this challenging mountain environment for thousands of years, thriving and adapting over time, only the fittest surviving these difficult ecological conditions–nature selects, the fittest survives. FMDs also lived in the coastal plains region for thousands of years. 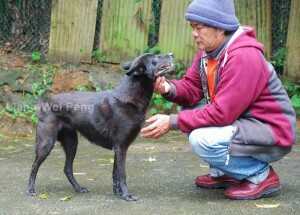 In fact Taiwan’s aboriginal dogs are traditionally divided into those adapted to the flat, coastal areas–the ‘plains dog’–and those adapted to the mountain regions– the ‘mountain dog’. 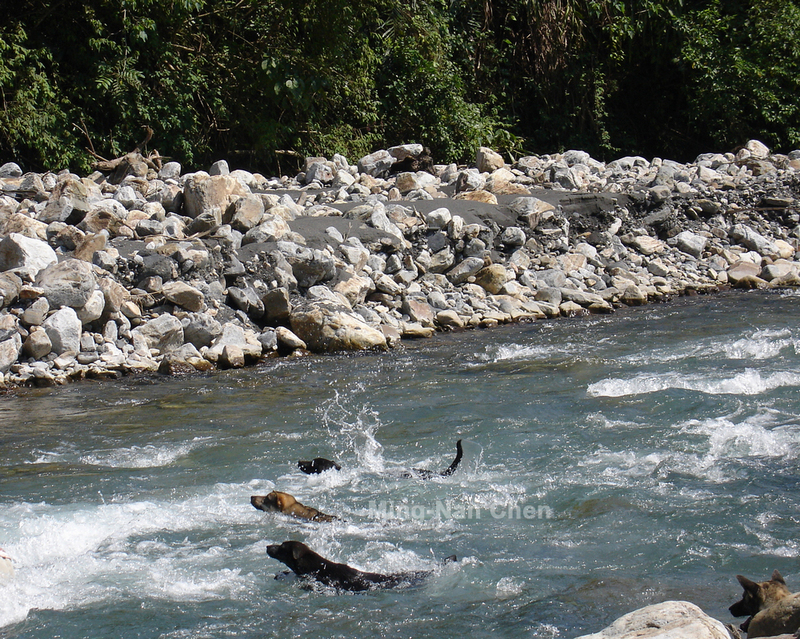 Each of these categories is further subdivided into different types according to slight differences in morphology and distribution (for example the ‘mountain dog’ can be further subdivided into the Atayal type and the Bunun type). Unfortunately, the ‘plains dog’ is now extinct, and only the ‘mountain dog’ has endured. 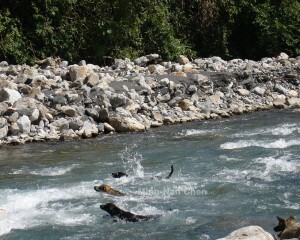 Therefore the Formosan ‘mountain dog’ is today the sole representative of Taiwan’s aboriginal dog. Taiwan is considered to be the Austronesian homeland. According to anthropology, archaeology and genetics, Austronesian ancestors migrated to Taiwan about 6,000 years ago, settling and diversifying into distinct aboriginal tribes. 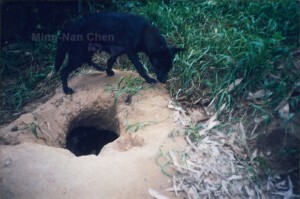 In the past, hunting was central to Taiwanese aboriginal culture, and the dog was an excellent and essential hunting partner that enhanced the human diet with protein-rich resources. 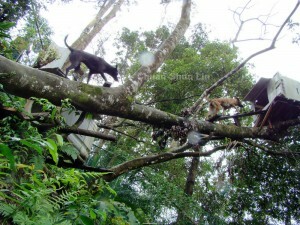 To better survive the extremes of Taiwan’s environment, aboriginals living in mountain areas relied on the dog to track and hunt wild mammals such as Formosan wild boar, Formosan sambar deer, Formosan serow and Formosan Reeve’s muntjac. The dog also acted as an important guard dog, for example when conflict arose in areas where hunting territories overlapped, or alerting villagers when outsiders or strangers invaded. The FMD thus possesses not only sensitive scent, vision, hearing and a strong hunting drive, but is also a vigilant and courageous companion eager to protect, guard, and attack if necessary. In 1980, an international cooperative project was carried out by scholars from the Nagoya and Gifu universities of Japan, and the National Taiwan University. They traveled throughout the mountains and aboriginal villages of Taiwan for two months, searching for native dogs that still retained these traits. Based on both morphology and blood protein analysis, the team concluded that FMDs were extremely rare and in danger of extinction, with only 46 individuals remaining. In general, the Formosan mountain dog is a medium-sized dog, with a shoulder height of about 50 cm for the male, and about 45 cm for the female. These are not strict, standardized measurements, and can vary within a range of plus or minus five centimeters. Typically, the FMD body is streamlined, with a deep chest and shrunken waist. The head is triangular, with a well-defined stop, moderate snout-length, erect ears, and orange, yellow, or dark brown almond-shaped keen eyes. Claws on the forelimbs point downwards creating a powerful grip and maximized digging ability. The hock is well-developed and slightly curved, allowing for strong and agile jumping. The tail is carried high (but not curled over the back) enabling a good sense of balance and stability. FMDs are very comfortable running freely through difficult, cliffy terrain, and their climbing and jumping abilities are formidable. For example they are known to climb trees in order to hunt animals, and are easily able to scale nearly vertical cliff faces. Coat color can vary between black, yellow, white-black, white, brindle, red, and chocolate. It is a double coat, with downy inner hairs that are warming and waterproof, and coarse outer hairs that create a protective barrier against thick forest and thorny bush. These morphological traits are well-suited to Taiwan’s mountainous environment, and reflect the dog’s long evolutionary history of mountain life. 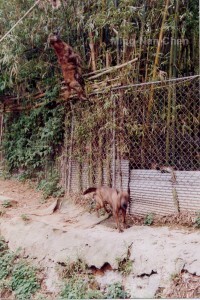 Formosan mountain dogs are aboriginal dogs that are semi-wild and retain many of the characteristics that wild canids do. 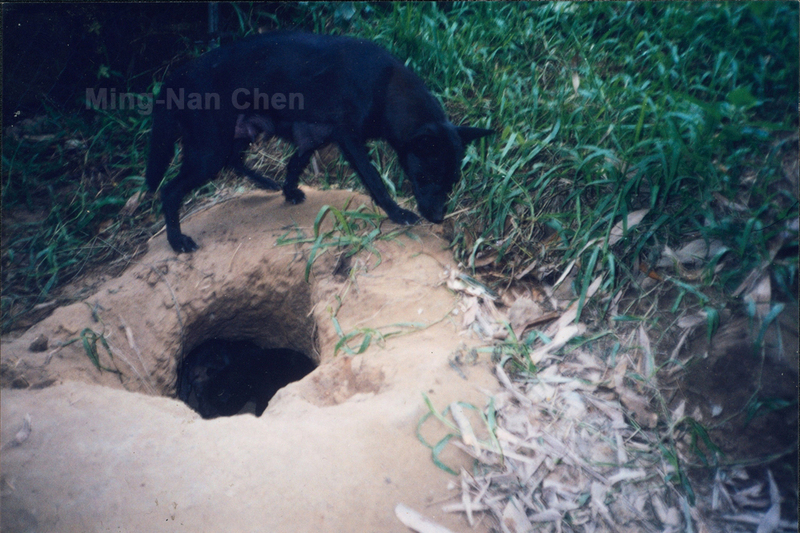 For example, females will dig a hole in the ground to create a den for birthing and raising pups. Although females come into estrus 2x’s per year, first litters are usually small (1-3 pups), and eventually increase over time, but do not usually exceed 5 pups. In the past, litter sizes did not tend to increase over time but rather remained small. The dogs mature in intelligence early, and have excellent disease resistance. They also have no body odor, much like wolves and other wild canids. They have a powerful bite force, and their digestive systems can easily handle bones (from large leg bones to small fish bones), starches (sweet potato), vegetables and fruits. FMDs do not bark randomly. They are very alert and well tuned to their surroundings, for example they will howl a few days before an earthquake or other impending natural disaster. They have a strong territorial instinct, and can easily orient themselves in space and time. Over the course of several millennia, the close-knit cooperation between hunter and dog has also created an animal with the keen ability to read his owner’s mind. The need to work together with little or no sound when hunting (so as not to scare off prey), often with great distances between hunter and dog, has resulted in the FMD’s uncanny capacity for understanding and foretelling what his human partner is thinking. Neither words nor barks need be exchanged. This ability, honed over at least several millennia, is a key characteristic of FMDs, and shows that they are highly intelligent and intuitive dogs. They also have excellent memory skills, are quick learners, and obey commands and leadership very well. They possess a spirit and tenacity that is unique and adaptable to many situations. They are fearless, audacious, and extremely independent. They are strong-willed and suspicious of strangers, but they are also very loyal and affectionate companions to family, and work enthusiastically in teams with great team spirit. All of these qualities together make for an excellent hunting dog, guard dog, or specialized working dog. 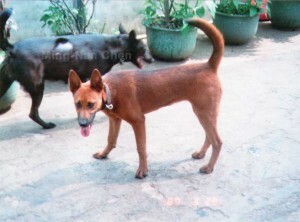 Recent DNA studies have revealed that the Formosan mountain dog has a unique, basal lineage, which is rooted at the base of the phylogenetic tree for Southeast Asian dogs. These results suggest that the FMD reflects an ancient lineage, little altered over the last several thousand years of its presence on the isolated mountainous island of Taiwan. In all of its morphological and behavioral traits, the FMD is thus a living representative of Taiwan’s natural and human history. It links us to our past, and carries on the legacy of its ancestors’ hunting and guarding functions. Despite this brilliant achievement, of having endured thousands of years of difficult and perilous environmental conditions and challenges, the FMD is now in danger of extinction. 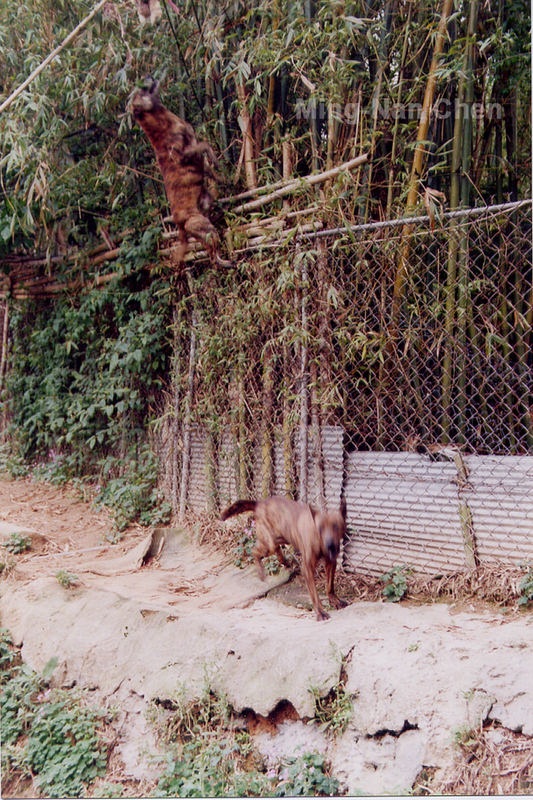 Since the last field study was conducted just thirty years ago, Taiwan’s aboriginal dogs have disappeared from mountaintop villages, and today only a small controlled breeding population survives. It is our sincere hope that these FMDs will be able to continue the great cycle of history, and that their ancient lineage will be conserved and handed down to future descendants for many years to come.